Third in a series of eight, this piece features Rune using his name from the Japan version of Phantasy Star IV, Thray. The sketches included on this mainly feature alternate versions of Rune. In one he is dressed as Lutz. 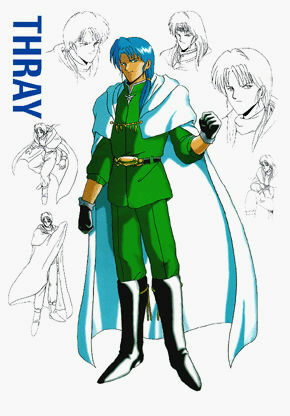 The others use an earlier version of his designs, which have a different outfit than the familiar one shown in color in the center. You may view the gallery page for Thray. I would like to see a more detail sketch of the one where Rune is dressed as Lutz. We'll be seeing some larger, better detailed Rune as Lutz stuff in the future. There's a good 14+ images with Rune that will be coming up at some point. A few of those are just Rune in his Lutz gear. Thoul wrote: We'll be seeing some larger, better detailed Rune as Lutz stuff in the future. There's a good 14+ images with Rune that will be coming up at some point. A few of those are just Rune in his Lutz gear. ASDFGHHJJJJKK!!!!! Thoul, I can't waaaaaaaaait! Yahoo! It's Thray, or is it Rune? Oh my gosh, he is handsome!!! Silver_Surfer1 wrote: Bumping up this former Image Of the Day! Both of them !Thray and Rune ! Great design !